Dr. Neelima Mantri: Should you be eating Organic foods during Pregnancy? Home » Pregnancy Tips » Should you be eating Organic foods during Pregnancy? Pregnancy is the most exciting phase in the life of a woman. It is quite common for you to feel antsy and nervous about the 9 months journey that you are about to take. Of course, you are filled with many questions about the lifestyle choices you will have to make for optimal development of your baby. Now that you are two, you will be in need of additional nutrients, vitamins, minerals and not to forget additional calories. An additional 300-500 calories are needed each day by the pregnant women from the day you enter your second trimester. All these additional requirements have to be met through a balanced diet of protein-rich foods, fruits, whole grains. Where do Organic foods fit in the mix? Maintain a balanced diet through a variety of food sourced do help, but what really counts is the quality of foods that are consumed to satiate the dietary requirements. The fruits, vegetables, that we consume are often produced using harsh pesticides, and chemicals, same might hold true for the meat products like Chicken (estrogen injection) and fish (high mercury levels). The risk of chemicals and pesticides though is minimal for an adult it could prove harmful for the baby in development. What are Organic foods? Are they a good choice for you? Organic foods are products of a farming process that do not use artificial chemicals, preservatives, hormones pesticides or Genetically Modified Organisms. Dairy products, fruits, vegetables, and meat are the most common choices of Organic foods. 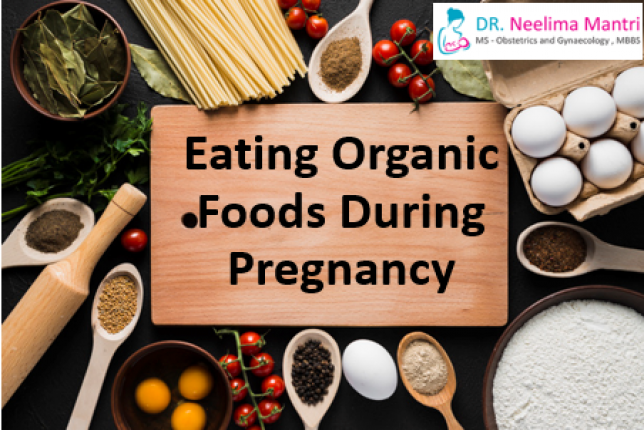 While Organic foods are recommended for everyone, they are more important for pregnant women. The harmful chemicals and pesticides consumed by the mother can find their way to the baby who is not strong enough to fight them. Moreover, organic foods are considered more nutritious and economically friendly too. So Organic foods truly make a great choice, especially for pregnant women. Wash clean the fruits and vegetables thoroughly to remove the chemical residue. Though the chemically are absorbed into the produce, removing the outer layer will drastically reduce the chemicals. Most of the chemical gets absorbed into the fat and skin of the meat. Make sure you remove the skin and fat of the meat products before consuming them. Avoid eating outside food if possible; especially the meat. Good nutrition and physical activity form the core of a healthy lifestyle. While the physical activity is limited, your dietary choices have a significant impact on your baby’s health and they are under your control too. So eat safely. Dr Neelima Mantri is one of the top most gynecologist in Mumbai who has vast experience in treating various issues related to pregnancy, infertility and women health issues. Feel free to contact her via email : info@drneelimamantri.com for booking appointments.